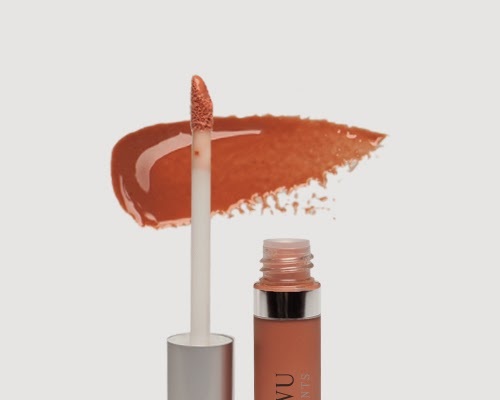 This Spring Votre Vu has several shades for both lips and eyes that will allow you to create looks inspired by a French woman's sense of style, while also pampering yourself with good-for-you ingredients and sun protection. First up are two great neutral shades of the French Kiss Moisture Rich lipstick: Colette (shown, above), which is a flattering, universal brownish/bronze shade with a touch of pink and Lisette, which is a more light peachy-brown. These lipsticks are so smooth and the color sets on the lips perfectly. They are moisturizing and have a nice, natural finish with a touch of shine. They are flavored with a subtle Vanilla-Mint, which is also yummy! If you want more shine or just a glossier lip shade, then their two latest Lip Lustre Vitamin E. Lip Glosses are perfect. Sultry is a shimmery bronze shade and Tender (shown, left) is a Coral-Pink shade I loved pairing with the Lisette lipstick when I wanted a touch more shine. These glosses are ultra lightweight, smooth, non-sticky and very moisturizing. They are also very pigmented, so just a touch with add beautiful color that looks great on it's own as well. For a neutral eye palette, their Palette Play (shown, left) was filled with four shades I used daily: New Canvas (the matte shade), Pale Earth (satin), Pretty Penny (the shimmer shade) and Rich Bronze (the other satin shade that makes a lovely eyeliner as well). These four shadows work perfectly together, or alone for more natural look. The deeper browns are perfect for shading/contouring the eyelid as well as lining, and they apply smoothly. The staying power was very good - lasting most of the day on me before I saw any fading or creasing. The Le Joli Crayon eye pencil is soft, smooth but has the perfect amount of pigment for defining as well as smudging color around the eye. Their shade, Chocolat (shown, left) is perfect with the other Spring shades and also has all day staying power. It's a medium-deep brown with a touch of red undertone. Once it's applied, it's pretty much budge proof and smudge proof. If you're looking for a slightly lighter eye liner shade for Spring/Summer, Chocolat is perfect. *These products were provided courtesy of Votre Vu PR for reviewing purposes.